This past Friday, I had a much needed "girls night out". I met some of my friends at this reggae spot to hear some 90's reggae and also celebrate a birthday. It was a fun! I didn't take any "real" outfit post kind of pictures, but this is all I got. 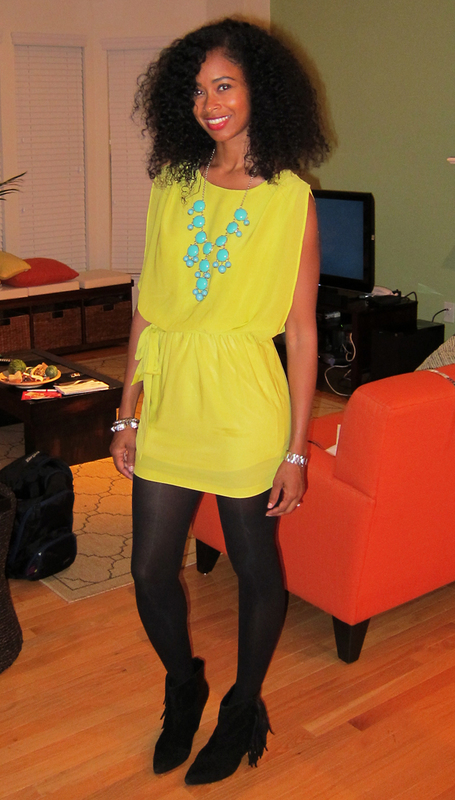 The dress looks yellow in the pictures, but it's actually a lime-y yellow (chartreuse). The owner (and friend) of Swaye Boutique sent me this dress months ago. I finally got around to wearing it. It's now on my faves list! You guys should really checkout that online store. She has a lot of new awesome stuff in. I love the look- you look gorgeous! I'm due for a Girls night out STAT!!! You look stunning!!! I love the colors! Gorgeous as usual! And I'm in LOVE with your new blog look. So cute!!! Lovely color on you and your hair is gorg! Love this color, way too winter it up! You are one hot mama! I love this look and the contrasting necklace. Very cute and your hair is Fab!!! Love this outfit! I've been wanting to try shoe dazzle for awhile now, I'll have to check out my showcase for this month.. I love your hair too!